No proof required: Just why are farmers rioting? The socio-economic explanation, according to experts, is that nobody wants to be a farmer anymore. 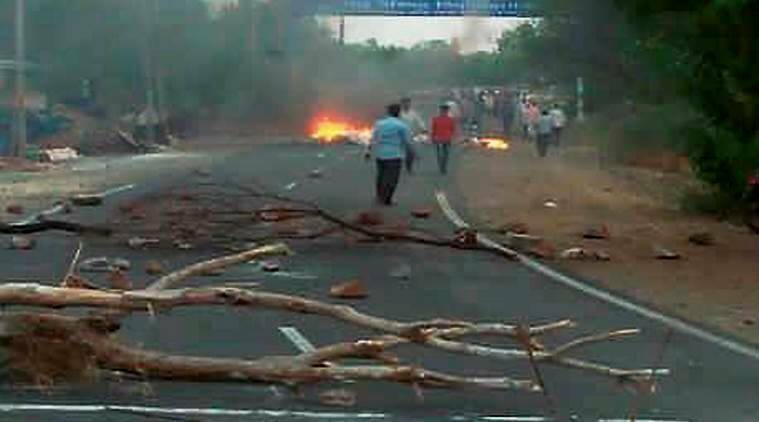 Is it political, or is there a socio-economic explanation for the farmer unrest (and riots) in Maharashtra and Madhya Pradesh? According to some, this unrest is liable to spread across the country. Hence, it is imperative that policymakers and analysts understand the causes behind the riots in order to best insure society, and farmers, from economic doom. The socio-economic explanation, according to experts, is that nobody wants to be a farmer anymore. And why? Because it is unremunerative, and relatively hard physical work. The children of farmers aspire for a well-paying urban job. This is a universal and “natural” phenomenon, which is why social scientists (and economists) have stressed that it is incumbent for policymakers to be forward-looking and prepare the “ground” for this change. But the economy is not producing enough jobs to accommodate the migrants from farmer families. This leads to frustration, despair, unrest. Hence, the riots. A related explanation for farmer unrest, according to the “experts”, is demonetisation. The “reasoning” is as follows. Demonetisation was, like a hurricane, an all-round destructive force. The poor farmers (are these the ones who are rioting?) need cash to transact sales, but there is no cash in the system. Hence, the farmers are rioting. And committing suicide. Just look at the data on suicides for confirmation. As TV anchors and journalist experts (in print and TV) will constantly remind you, there are over 12,000 farmers committing suicide. As one politician recently reminded me, he was concerned about the plight of farmers because he was in touch with some families where there had been a suicide. He believed that by talking to them (and even invited me to come along), I would correct my “inhuman” attitude towards farmers. What exactly is my insensitive, inhuman view of farmer suicides? That the suicide of a loved one is one of the most inexplicable and depressing occurrences for any family member, or friend, to experience. That most of us, beyond a certain age, have known a dear one to have committed suicide. That suicide is a much-studied problem and that poverty is not known to be one of the major causes of suicide. And that one should not demean a highly tragic personal experience in order to score narrow political points. Finally, appealing to suicides to address public policy is nothing short of emotional blackmail. Citing the numbers of farmers who have committed suicide does not add much knowledge to understanding why farmers are rioting in Madhya Pradesh and Maharashtra. For starters, farmer suicides, while numbering 12,600, have declined, from a peak level of 18,241 in 2004, and 17,368 in 2009. Notably, 2004 was a good agricultural year, 2009, a drought year. Housewife suicides stayed in the 23,000 range for the last decade. Student suicides have risen by over 60 per cent since 2001, and now number 8,900. Suicide is a complex social and cultural phenomenon. Let us not reduce it to a political soundbyte. Coming back to the mystery of farmer agitations circa 2017. Is this economic, or political? The answer is that it is heavily political. Allow me to reject the economic explanation. Recall that what we are trying to explain are 2017’s farmer riots. Indian farmers faced two consecutive years of drought in 2014-15 and 2015-16. Such an occurrence — two droughts in a row — only happened five times since 1870, and on three occasions in independent India: The mid-sixties, the mid-eighties and now. Despite this rare farmer tragedy, we did not observe any farmer riots during the recent drought years. We read a lot about collapsing food prices and the lowering of farmer incomes as identifiable causes of riots (and suicides). How have food prices performed over the last three years? The table documents the course of prices of six food items. 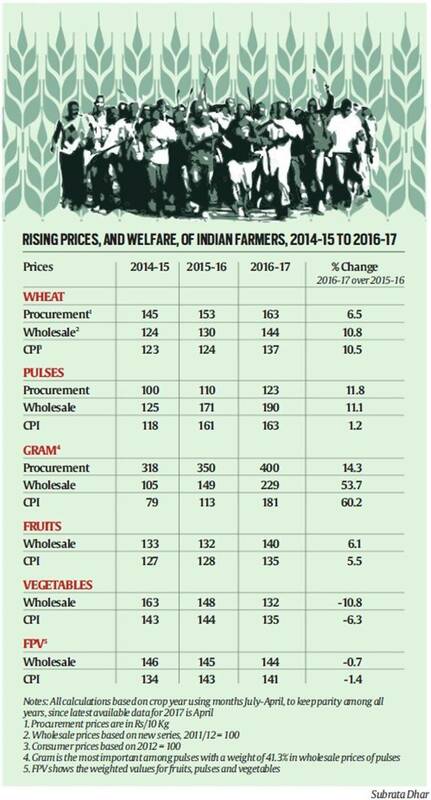 Two dominant conclusions are, (i) producer prices (whether minimum support prices of the government of India or wholesale prices) have risen by about 5 to 10 per cent over the last year; (ii) at the same time, consumer prices of selected and volatile food items (fruits, vegetables and pulses) have stayed broadly constant over the last three years. (RBI, MPC and other inflation experts, please note this constancy over three years!). One constant refrain is that pulse prices have gone below their MSPs. While no doubt this occurred for selected items, in the aggregate, procurement prices of pulses have risen an average of 11 per cent in each of the last two years; the wholesale price of pulses is up a hefty 52 per cent since 2014-15. Incomes have also increased, and sharply, in this post-drought (but riot-prone?) year. Pulse production is up 30 per cent, providing the farmer with an income gain of more than 40 per cent in 2016-17. Wheat farmer incomes are up at least 10 per cent. So, where is the problem, or, as the Americans say, where is the beef? There is an additional dimension to the story that farmer riots are politically motivated. Reports suggest there is a lot of looting, and stealing of liquor. By farmers, or who? As a social scientist, I have been taught that who gains and who benefits is a useful starting point for most questions about policy, and politics. So, who benefits from stirring up riots? Let us examine what has happened politically over the last three years. First, politicians outside the BJP have been badly hurt. There is little likelihood of an opposition party, or an opposition alliance, coming to power in 2019. Note how experts no longer talk about a week being enough time for politics to change course. Now, even five years (let alone the two years till the next election in 2019) may not be enough for an opposition force to arrive. More bothered than the opposition outside the BJP tent is the opposition inside. Just look at how the Shiv Sena is running scared. Even after Maharashtra Chief Minister Devendra Fadnavis promised a loan waiver, benefiting the vast majority of the indebted poor, farmer riots have continued. Also, for political inferences, a dissection of the “beef ban” is necessary. Maybe the Supreme Court has more to do with the beef ban injustice than any politician. In any case, the beef ban, and the rank anti-Muslim communalism associated with it, does not benefit PM Modi or the BJP. It does not garner any new votes, and it loses some old votes. So, if Modi/BJP lose from the beef ban, who gains? A parallel phenomenon to the rise and rise of PM Modi is the fall and fall of the influence of the RSS. Prior to the UP election, there was a lot of talk about the RSS cadres being essential to the BJP; in my travels in UP and discussions with several expert commentators, the near-universal conclusion is that the UP vote was for Modi, not for the BJP, and definitely not the RSS. The support for Modi is among the vast majority of the emerging and emerged middle class. This large group has aspirations for a modern India, complete with education, jobs and freedom of thought and action. No modern country, and certainly no diverse country like India, can afford to restrict the young and the old in their freedom to choose. Does the RSS think that it can gain credibility, and support, by harking back to its own imaginary Hindu era?